Transocean is holding a memorial today for those who died in the Deepwater Horizon in Jackson, Miss. .
People have died. 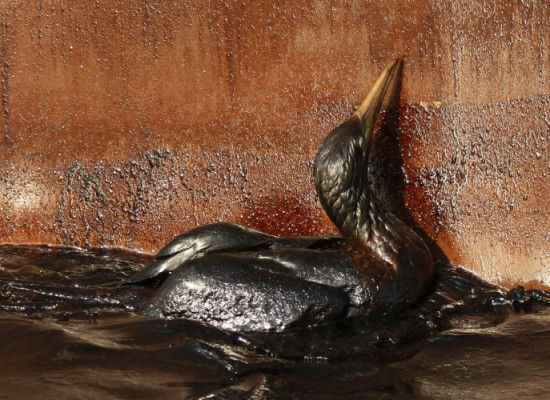 The US government is now calling it the worst oil spill ever. Three teenagers from New York City’s Upper West Side, however, tried something different. This is their story and here is their petition. The news coming out of the Gulf coast suggests that there is a great deal of denial, at best, or according to some scientists quoted in the NYTimes, an actual suppression of information. Brit Hume actually asked, “Where is the oil?” (See it at climateprogress.org). I suppose he hasn’t had the opportunity to check in with sick fishermen. Just today BP is finally announcing that they may be underestimating the amount of oil washing up onshore. Excuse me, but wasn’t that obvious? The general population (outside the Gulf) is paying little attention to this event. There is not as much outrage or concern as may have been expected given public reaction to other crises. What is going on? Consider that this event may simply be too big and too frightening. The human mind shuts down when there is too much stimulation, or, when threatened it shifts into ultra-focus. This can cause people to diminish and ignore what is happening. People will blame the government for not acting strongly enough. Yet we should also not forget that few individuals have demanded that their government take this seriously. For the most part, people here in NYC are enjoying their lattes. While this makes sense given what we know about the mind’s penchant for closing itself off from uncomfortable information, it is the human trait that will most directly lead to our peril. Yet, there is enough education to counteract the cognitive hyper-focus that keeps threatening events out of an individual’s attentional radius. Look here for a local take on what is taking place in Louisiana right now. Perhaps what is really making this hard for the average person is that this is the world upon which we all depend and no one wants to contemplate what it might really mean if this is as bad as it seems. Plus, acknowledging the magnitude of this disaster confronts us all with the reality that those who we have empowered have taken advantage of our trust. While it may be hard to accept the magnitude of the oil industry’s betrayal, it does seem as though continued blindness will hurt more. More graphic photos will help break through people’s defenses. The worse it gets, the more painful, harmful, dangerous and ugly this becomes, the more the citizenry may wake up and demand honesty as well as policy change. Yet one wonders if it might be too late. 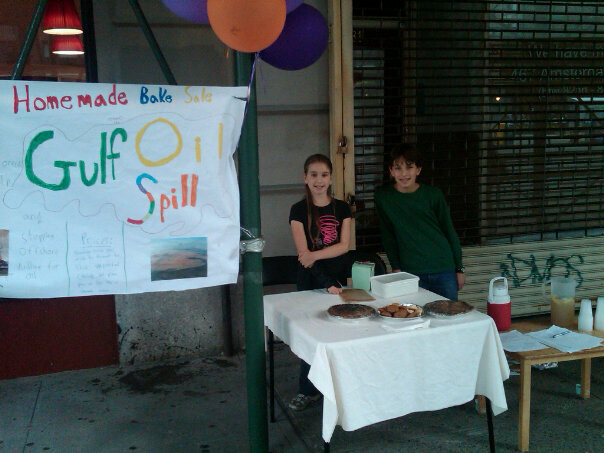 I have been told that a few NYC kids will be holding a bake sale to raise money for Defenders of Wildlife and the NRDC, both of which are raising money for animal support, petition drives for climate change legislation, and to cease offshore drilling as well as legal action. Let’s see what happens. I’m curious as to how passers-by will respond. As predicted there is more graphic imagery, and people are starting to get upset, Chris Matthews calling is the “scariest thing he has ever seen“. Let’s see what happens to the person in the street. Read this. Krugman echoes comments by Glenn Albrecht. The surprising issue is that given the severity of this disaster, so few people seem as upset as I might expect, at least here in NYC. I venture to say, however, that unless you live along the Gulf coast or work in it waters, the implications of this oil spill event are being conveniently tucked away in the dark corners of people’s minds. At a dinner over the weekend, friends commented, “This is terrible,” looking anguished and frightened in a manner that tightened their eyes. No one that I spoke to was motivated to do anything. There are, however, psychological concepts that can explain such apathy. They can also suggest strategies to enable a more authentic national dialogue about our energy choices. 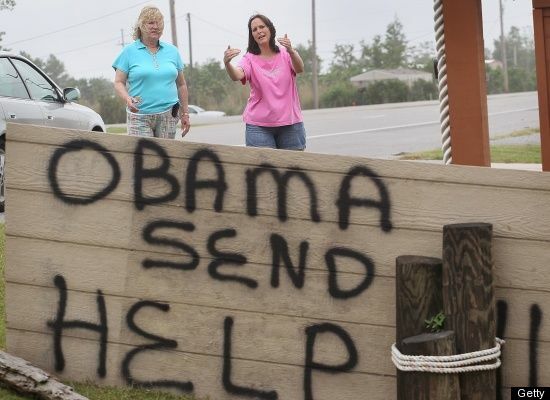 The Gulf Coast doesn’t only need Obama. It needs the citizenry.